We’ve been making an effort to eat more fruits and vegetables, so we love making really good vegetarian recipes. There have been loads of little summer squashes at the market lately. They are not the most flavorful squash by themselves, so we typically use them for these herb and ricotta toasts. 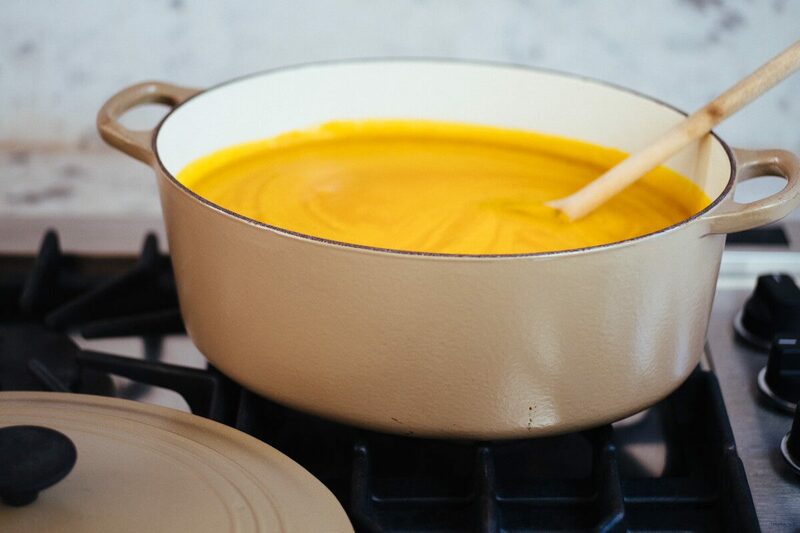 We love fall squash soups, so we thought we’d try making a summer squash soup. It was pretty fantastic! Ever since we found “no-chicken” stock, we’ve been hooked. It’s a great vegetarian stock that is richer than vegetable stock and a perfect substitute for any recipe that calls for chicken stock. You can also order it online here. 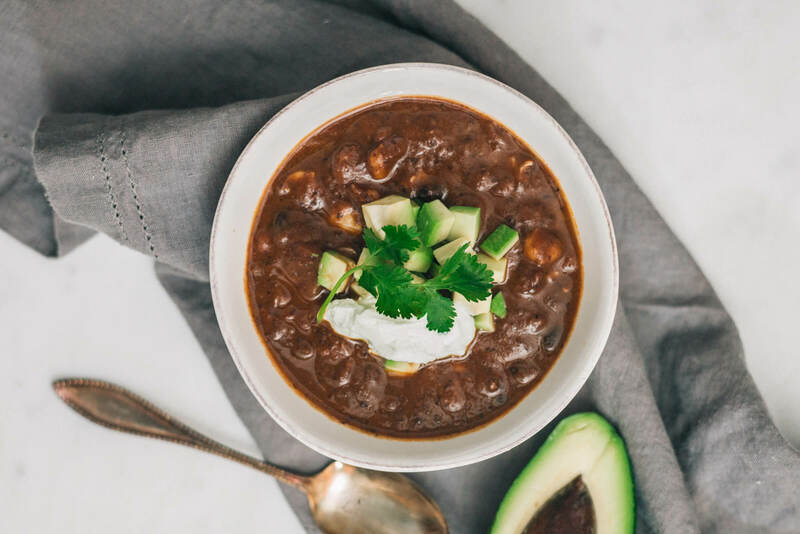 It’s great for our vegan readers, and this soup can be made completely vegan by substituting a different yogurt like coconut or soy. We made our soup in our Staub dutch oven (c/o). It’s the perfect size for small batches of quick soups. You can make this in under 30 minutes. Since it’s blended at the end, you don’t need to worry about cutting everything perfectly. We started by sauteing a sliced onion in olive oil, and then adding our spices. We used turmeric, coriander, paprika, cumin, and this very hot cayenne pepper (a little goes a long way!). Next, add your squash, cut into large chunks, and toss to coat evenly with the spices. 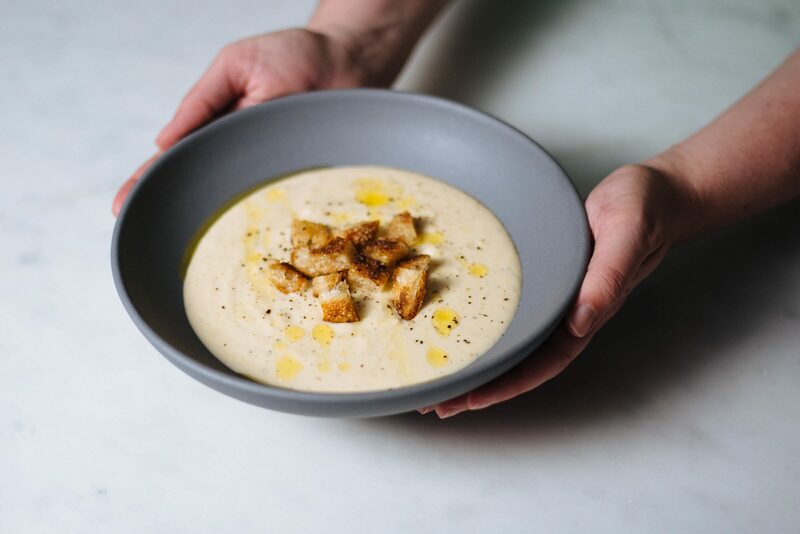 We found the soup to be a little thin, so we would recommend adding a tablespoon or two of flour at this point and tossing it with the squash to coat it evenly and cook off the raw flour taste. Add your no-chicken stock and simmer until the squash is cooked through, about 15-20 minutes. While your soup is simmering away, you can get your toppings ready. We used a chiffonade of mint. Just take a few mint leaves, lay them on top of each other and roll them lengthwise. Cut across in very fine slices. Use your sharpest chef knife for this. We used Clayton’s favorite new knife for it. He loves good cooking knives and hasn’t stopped using this one since he got it. When you’re ready to serve the soup, puree it in a blender. We used our Vitamix on the puree setting, but if you prefer, you can also use an immersion blender. Just be careful not to hurt the inside of your pan if you’re using an enameled dutch oven. We served our soup in these beautiful bowls by Juliska and topped it with a big spoonful of yogurt and the mint. The yogurt adds some creaminess and richness, and the mint adds a fresh pop of flavor. A perfect summer lunch! Add the peeled garlic cloves to ¼ cup of olive oil in the bottom of a dutch oven. Heating the garlic in the oil helps infuse the oil with more flavor. When the oil is hot, add the finely sliced onions and saute until they soften, then add all of the spices, as well as a pinch of salt. Continue to saute the onions, along with the spices, until the spices are fragrant. Add the cut up squash to the dutch oven and toss with the onions and spices to coat, then sprinkle over 1 tablespoon of flour. Toss this a few times and cook for a minute. Add the stock to the rest of the ingredients, stirring constantly. Bring to a boil, then reduce heat to simmer and allow the soup to simmer until the squash is fork-tender, about 15-20 minutes. Puree the soup with an immersion blender, or by transferring it to a blender, working in batches if needed. Be careful not to overfill the blender with hot soup. Transfer the soup back to the dutch oven and keep warm until ready to serve. Adjust for salt, if necessary, and top with a spoonful of yogurt and fresh mint to serve.